This is, for all intents and purposes, the new version of the 2017 Easton Z-Core Hybrid. We took the new Beast X Hybrid for a spin in both the BBCOR and USABat versions. That feedback, combined with our experience with the 2017 and 2016 versions of this bat put us in a place to write this 2018 Ea… Jump to the full review. We aren’t the only ones to have information about the Beast X Hybrid. Other places, in particular those who sell bats, usually have a boiler plate write up on the specs of a bat. Many of those we reference to make sure we are seeing what we should be. Here are some more references for the 2018 Easton Beast X Hybrid review. This is, for all intents and purposes, the new version of the 2017 Easton Z-Core Hybrid. We took the new Beast X Hybrid for a spin in both the BBCOR and USABat versions. That feedback, combined with our experience with the 2017 and 2016 versions of this bat put us in a place to write this 2018 Easton Beast X Hybrid Review. As a general rule, we like the idea of hybrid bats (and the Beast X) for those who: Prefer hot out of the wrapper performance; Like the more buttery smash of a two piece bat. We would add the Hybrid X to the short list of players who: Like a slight end-load to their bat; Want the largest barrel on a hybrid bat for 2018; Are in the BBCOR or USABat market; Seek a good value on a performance two piece bat in the USABat space. Hesitate if you want the largest barrel possible, like an ultra light swing, like the direct power of a stiff single piece bat. As well, might want to look elsewhere if you are on a tight budget, need a USSSA bat or need an ultra light swing. The only disadvantage the Easton Beast X Hybrid in a USABat version has is its end load. It should be considered a drop 8 bat. But, it can absolutely rake. Durability is great, reviews are positive (if they knew they were getting a heavier swinging bat). It is one of our favorite 2018 USA Bats on the market. If you can swing it you should swing it. Functionally, it is hard to make the argument the 2018 Beast X Hybrid is considerably different than the 2017 Z-Core Hybrid. They both use the same Z-Core barrel that was made famous in the 2016 version. The barrel size was upgraded from the 2016 Z-Core Hybrid, so we shy away from that version if at all possible. Although prices on that 2016, at the time of this writing, are very attractive. In terms of marketing appeal and some minor upgrades, the 2018 Beast X Hybrid does come equipped with a new name for its barrel. The alloy is an upgrade, in Easton's view at least, in terms of durability and performance. The tactile difference between 2018 and 2017 is the thicker grip (1.4mm) in 2018 when compared to the 1.2mm grip for the 2017 Z-Core Hybrid. A slightly end loaded two piece hybrid bat in the performance space is not common. We think Demarini’s Voodoo in the balanced version might be the closest in terms of a proven workhorse with a smooth smash and a great performing barrel. The Voodoo Balanced also comes in a BBCOR and USABat, as well as some USSSA options. For an off the beaten path option that is built similarly, take a look at the Axe Elite. Do note, too, in the BBCOR and USABat niche, no hybrid bat comes with as large a barrel as the Easton Beast X Hybrid. The 2018 Easton Beast X Hybrid is one of, if not our favorite, 2018 USA baseball bat. After hours of hitting, measuring and rating the Beast X Hybrid all our hitters love the feel at contact and results on our Rapsodo exit velocity device. As parents we liked the price, durability and ball flight. However, the bat swings heavy is probably better categorized as a drop 8 or drop 9. More of our insights and recommendations are found below in our 2018 Easton Beast X Hybrid USABat Review. The only slight disadvantage we could think of when testing the Easton Beast X Hybrid in a USABat version for 2018 was the fact it ran a bit end loaded. Some have claimed the bat’s overweight makes it more of a drop 8 then a drop 10. But, we always like to stress, swing weight is what matters not total actual weight. And the Beast X Hybrid is a legit end-loaded drop 10 bat. Other than then the weight conversation, all our commentary on the Beast X Hybrid USABat is glowing. We love the feel at contact, the explosive ball exit speeds and the big barrel. The price point in the mid $200 seems more reasonable than a $300+ bat in the USABat space. All in all we would recommend the Beast X Hybrid for anyone that can swing it. Which, assuming this isn’t your first year or two in Little League, is just about everyone. The Easton Beast X Hybrid USABat is built the same as its BBCOR version. That is, a two piece hybrid bat with a composite handle and aluminum barrel. The design is built to deliver a smooth swing on both hits and mishits while also giving the player some hot out of the wrapper performance. Although the Beast X Hybrid USABat is a brand new bat in Easton’s lineup, the connective piece is old hat. They have been using this same tech, or something quite similar, for several years across several different bats. As well, Easton is no stranger to composite handles. The handle on Easton’s is a new version of what they have been successfully producing for years. The real new thing in Easton’s lineup is the drop 10 USABat barrel. They use an ATEC barrel (2 5/8) which is an aluminum alloy design built noticeably bigger than other aluminum bat barrels in the USABat space. Easton’s Beast X Hybrid comes in one 2 5/8 version. A drop 10 with sizes 29 to 32 inches in length. 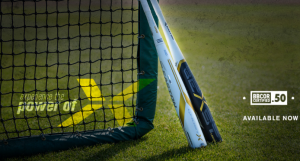 The 2018 Easton Beast X Hybrid is made from a composite handle welded to an aluminum barrel. The barrel is remarkably large—especially compared to other bats of its type. Easton has used the same connective piece, roughly, since they made the Mako back in 2014. This is referred to as a Connection+ (used to be CXN). It does an industry standard job of creating enough give for a smooth smash, but keeping power in the stroke. Durability is rarely a cocen for hybrid bats. Especially when the company making the bat has been producing it for several years. Easton has produced a hybrid bat in the BBCOR space for as long as we can remember. In other words, durability should be of no concern. (But that does not mean we suggest you buy it from some place that does not carry a warranty).